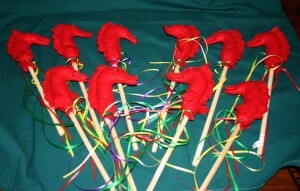 One of my favorite toys to see running around camp is a stick pony. 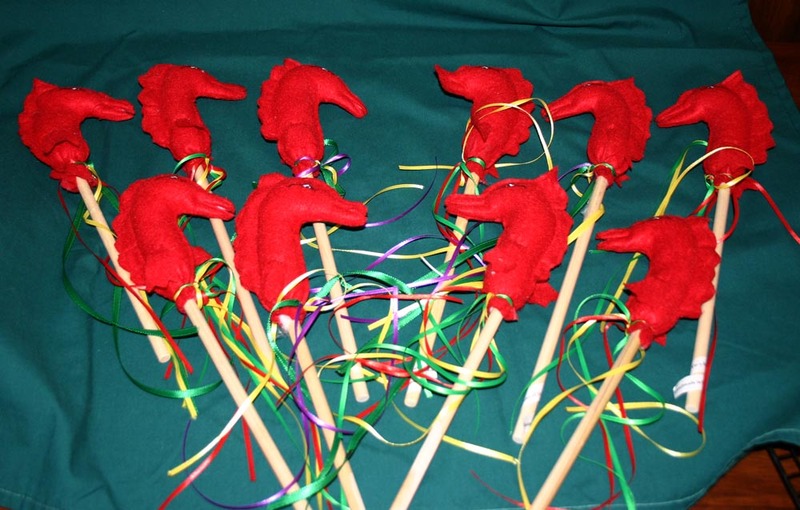 I have made hundreds of stick ponies. I live in the Kingdom of Atlantia, so technically these are stick Dolphins designed from The Barony of Tir-y-Don’s arms. Every year around December when folks start to get busy with Christmas activities our Arts and Sciences meeting (usually held at my house) switches to toys. 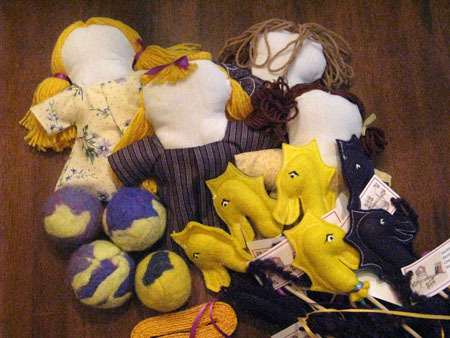 We make a few dozen toys each year and donate them to a children gift basket. Most years I try to add a new toy. In 2011 we added snakes. They were a great hit with my children. 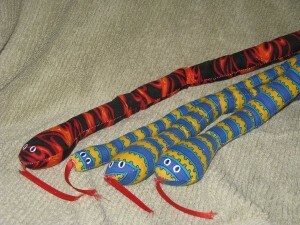 Just make sure you do not over stuff the snake it should be able to bend and be a bit floppy. Every year we add a dozen or so felted balls. The center of the balls hold a wiffle ball and a bell. 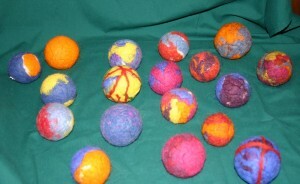 The balls are soft and safe for any age child. 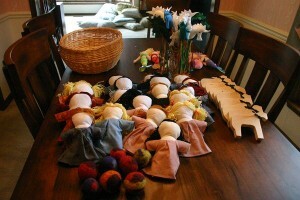 We use an assembly line set up to sew rag dolls. One person sews bodies, an other clips and turns…ect. all the way down to the Lovely Lady in our Barony who likes to style hair. After awhile the doll crew started to complain about making doll clothes. My solution was to make picts with wild blue fabric for their tattoos and braids in their hair. I do not usually put faces on most of the dolls I make. Sometimes that bothers children and I will see a parent stitching eyes or a face on the doll. My kids just accept it. One year our Pennsic Gift Basket went to Calontir. Their colors are purple and yellow. I made a set of toys which matched the purple and gold heraldry. I love to play games. As my children age they are becoming much better players and it is more fun. 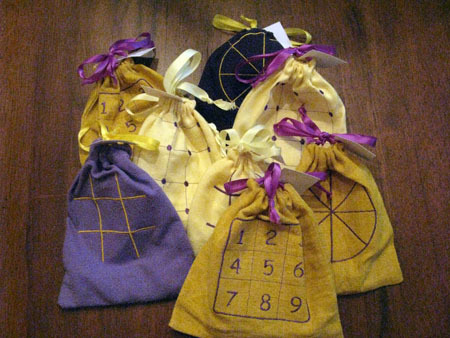 These games were also sent to Calontir. They were made on an Embroidery machine. I must have been pressed for time that year.